Picture by David Bradley. This picture and many others of trolleybuses can be viewed at his fine trolleybus website. 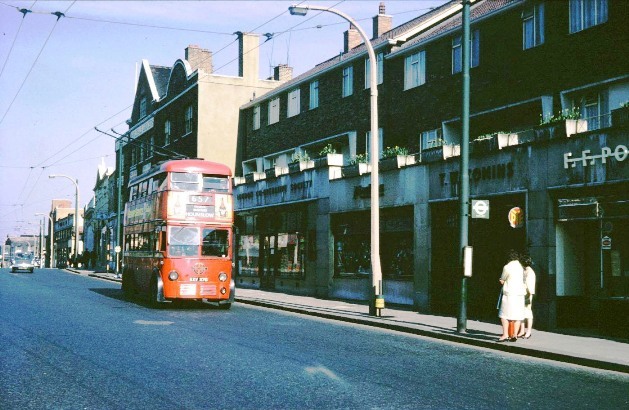 The photo shows the trolleybus travelling west along the High Street towards Hounslow. The prominent building behind the trolleybus is Bradbury's, the wholesale grocers at no. 108/9. The gaps between the older buildings and County Parade with its flower boxes is probably Plough Yard. County Parade includes the London Co-operative Society, V W Comins (?) with an enamel sign for Pye and F F Poole, the butchers and were approximately numbers 115 - 118.